- Support for more graphics modes and cards. - New OPL emulation cores. - Sound fixes and improvements for Mac OS X. - Lots of compatibility fixes. - Lots of cdrom detection improvements. - Lots of memory (EMS/XMS) improvements. - Various fixes and enhancements for the recompiling core. - Lots of DOS fixes. el evdev me ha traido loco en linux, es una biblioteca plug and play nueva que han desarrollado, y por el momento trae algunas incompatibilidades con la antigua gestión de dispositivos. Os comunico que la última versión del proyecto (0.73) ha sido ya traducida a diferentes idiomas y se encuentra disponible para ser usada. Además, un nuevo "frontend" ha sido creado con el nombre "Ampshell" y los ya existentes "D-Fend Reloaded" y DBGL han sido adaptados a esta última versión. The CGA got linebased screen updates. 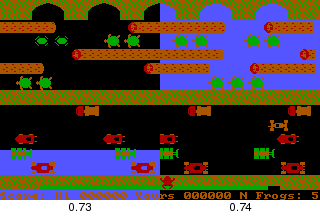 Combined with the improved timers and modeswitch synchronisation, this improves Frogger a lot. The hercules emulation can switch between white, green, amber monochrome support. All (S)VGA modes got support for blanking values wrapping around to the start of the screen. This improves support for Sid & Al's Incredible Toons. The accuracy of the timer with repeating events got improved (most noticeable when using the dynamic core). 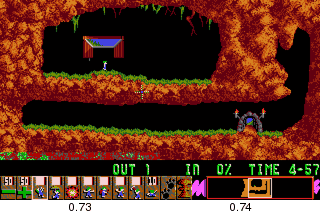 This results in lemmings looking better. • Fix a stack overflow that could crash DOSBox. • Modify adlib turn off code, so that it doesn't turn off in cases where the same sound is repeated over and over again. • Some small CPU fixes that might fix something. • Remove old OPL cores as the new ones seem to work very nicely. • Modify movie recording code so that the movies aren't corrupt when you exit dosbox without stopping the movie. • Change RGB3x scaler to look more pretty. • Improve initial register values compatility of the GUS. • Change render preferences a bit to be more compatible with Windows 7. • Modify game specific hacks a bit so that Kick off 3 works again. • CGA, PCJr, Tandy: Add video blanking, change display start latch timing, sync pulse width correction. • PCJr, Tandy: implement vertical retrace interrupt. 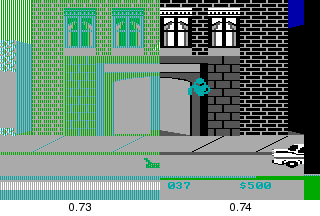 • PCJr, CGA: line-by-line video emulation. • Hercules: Add green and amber monochrome support. • Several small DOS fixes. • Small improvements and fixes to the OPL emulation. • Add low level Tandy DAC emulation. • Improve mouse emulation to work better with Water World. • Hopefully fix the translation of the configuration file. • Fix compilation with new MAC os X version. • Add 16C550A FIFO support to the serial port emulation. • Improve modem emulation to get higher speeds. • Change default samplerates to 44100, blocksize to 1024 and prebuffer to 20, so that hopefully certain soundcards produce more fluent sound playback. • Add some rarely used, but for some games critical flags to the internal commands. • Add -userconf flag, so that the userspecific configuration can easily be used together with -conf configfile. • Improve internal timing with repeating timers (especially with the dynamic core). Para los que usemos una versión de GNU/Linux basada en Debian como Ubuntu, existe un paquete debian en fase de prueba. Pues sé de algunos como Yo_matias y Puaj a los que les va a servir de mucha ayuda. ¡Muchas gracias, Wincrash32! Os comunico, ya que hay mucha gente que no está al corriente de ello, que existen dos versiones independientes de la oficial de "DOSBox" que operan a modo de "build" pero que trabajan bajo la misma interfaz y estructura. 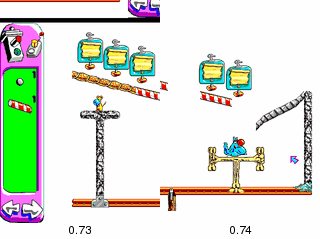 La principal ventaja que presentan es que soportan y emulan tarjetas gráficas 3dfx/Glide para aquellos juegos de finales de los 90 que incluían dichas mejoras en su motor gráfico tanto en Windows como en MS-DOS.